Aggressive behaviour is only one of the issues in our society as is livestock chasing, excessive barking, jumping up or even pulling on the lead, none of these behaviours are breed specific. 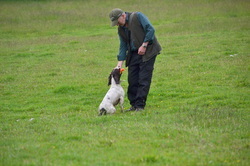 With planned conditioning and rehabilitation almost all behaviours can be changed with the involvement of the owner/handler. Specific behaviours such as, recall, delivery of a retrieve item, socialisation, guarding or fear phobias. These can be broken down with specific training plans.